Football is a universal currency. The first world war demonstrated that when troops climbed out of the trenches to kick the ball around on Christmas Day. Germans and Englishmen have always debated the great game, usually centred on 1966 and the infamous “over the line or not” argument. In 1978, on holiday in Spain, a group of teenagers bumped into a bunch of Germans, most of whom could not speak English. Being Brits ourselves, we could not speak any German apart from words learned from comics: “Himmel”, “Achtung” and “Ja!” and that was about it. But we knew all about Borrusia Moenchengladbach and Bayern Munich. We admired Franz Beckenbauer, Gerd Mueller and Gunter Netzer. And our friends from Westphalia were familiar with Liverpool, the European Champions. They especially liked a tall Welshman – John Toshack. “TOSHACK!”, they shouted and mimed a thumping header. They remembered him, the imposing and very effective John Toshack….and his partner Kevin Keegan, who by now was plying his trade in Germany. We came across this happy and beer-swilling gang of Germans for several days and each time, our burly friend with the beard would shout at us, “TOSHACK” and score another imaginary goal with his head. This chap was forever known as Toshack, and he probably called us by the same name in return. John Toshack and Kevin Keegan formed a compelling partnership in the early 1970s that was hard to beat. The inimitable, and much imitated, mix of big tall guy and small, buzz-around short-arse striker. At its peak, the partnership between Toshack and Keegan was very successful. Ask many Liverpool fans which player has been the most influential over the years at Anfield and a fair percentage will say Kevin Keegan. While Kenny Dalglish had the skill and longevity, Keegan had the personality to spark change at Liverpool. 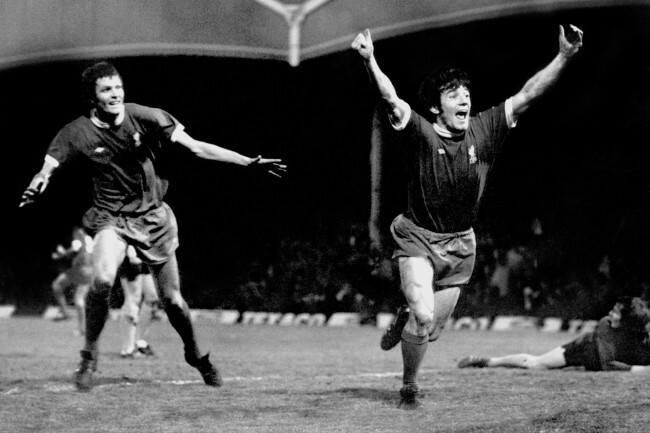 Dalglish was the better, more accomplished player, without doubt, but Keegan had something that the taciturn Scot never possessed: enormous charisma. By 1971, Liverpool were out of their 60s golden period of 1963-66 and were still trying to forge a new team that could win League Championships. Players like Ian St.John (sold to Coventry, August 1971), Hunt (to Bolton 1969) and Ron Yeats (to Tranmere, August 1971) had made way for new blood and others, like Peter Thompson and Ian Callaghan were supposedly at the tail-end of their career. In over five years at Cardiff, Toshack had scored 74 goals in 162 League games and had shone in European competition. He was only 21 years-old, but one of the most coveted strikers in the Football League. He soon won over the Liverpool fans when he scored in his second game, the Merseyside derby against Everton. He developed a habit of finding the net in big games – a 1-1 draw at Leeds, a 2-0 win against eventual champions Arsenal and then the only goal as Liverpool beat Don Revie’s side 1-0 at Elland Road. At the end of 1970-71, Liverpool reached the FA Cup final, only to lose 2-1 to Arsenal, and finished fifth in the League. But goals were a problem for Shankly’s well-drilled side, who scored just 42 (30 fewer than Leeds and 29 less than Arsenal) in as many games. At the other end, they conceded just 24, the lowest in the first division. Defence, marshalled by the likes of Tommy Smith, Chris Lawler and Emlyn Hughes, was sound, and players like Steve Heighway and Brian Hall gave the midfield width. Up front, Phil Boersma and Alun Evans were not going to cut it. Toshack needed a partner, and he came from the unlikely source of Scunthorpe United, costing £ 30,000. His name was Kevin Keegan. He was relatively unknown at the time and right up until the eve of his debut against Nottingham Forest, Keegan was expected to be on the bench. But Shankly surprised everyone by including the youngster in a Liverpool side with an average age of just over 23. “I have not the slightest doubt about playing him,” he said. “I’m looking for a balance and he can help achieve it.” Keegan, lining up alongside Toshack, scored on his debut and thus a fans’ favourite was born. His early months were like a whirlwind, he soon became the golden boy of British football, taking on the mantle from the troubled George Best. Toshack had his problems, however, suffering injuries and not quite finding his place at Anfield. That said, “Tosh” scored 13 goals in 34 games in 1971-72 to Keegan’s 11 in 42. The 1972-73 season was where the “TOSHACK” legend was formed with our German friends. Liverpool had won their third League title under Shankly and faced Borussia Moenchengladbach in the UEFA Cup final. Toshack had been sidelined for two months but was recalled for the first leg at Anfield. The big Welshman caused havoc in the German defence, linking up with Keegan to spectacular effect. He created two goals, the first when he met a Chris Lawler cross and nodded on for Keegan to dive headlong to score, and then knocking on an Emlyn Hughes header for Keegan to net once more. “Borussia could do nothing with Toshack in the air,” said the match report of the game, which Liverpool won 3-0. They lost the second leg 0-2 in Germany, but took home the impressive UEFA Cup trophy. In 1973-74, the duo scored 30 goals between them, but injuries once more restricted Toshack’s appearances and put his place under pressure. Liverpool won the FA Cup, comfortably beating Newcastle in the final by 3-0. Toshack played and Keegan starred, but in the summer of 1974, Shankly retired and Bob Paisley took over. Ray Kennedy of Arsenal arrived for a big fee and looked the tailor-made replacement for Toshack. 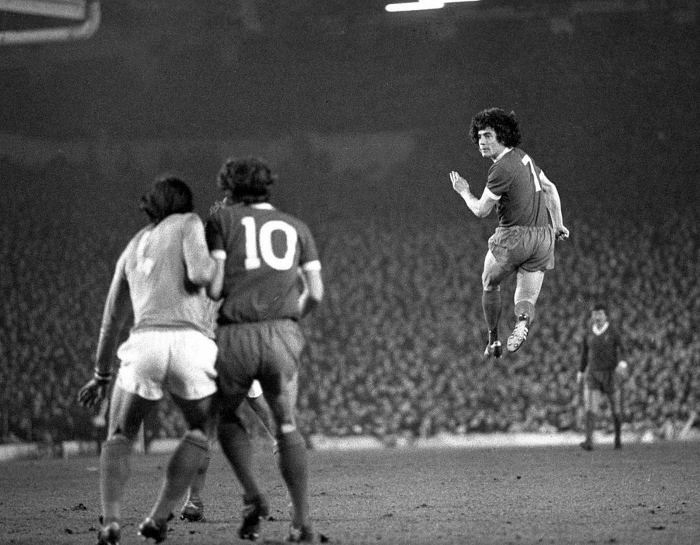 If Kennedy’s presence put pressure on Toshack at the start of 1974-75, Keegan had a dreadful start to the campaign. With his mentor gone – Keegan and Shankly had a famously close relationship – there seemed to be something troubling the diminutive striker. He was sent off in a pre-season game at Kaiserslautern and then, a few days later, in the full glare of the media, he was dismissed again after fighting with Billy Bremner of Leeds in the first Wembley FA Charity Shield. Both players received hefty bans, although public opinion was that Keegan seemed to be a victim of Bremner’s mission to make the afternoon thoroughly miserable for his opponent. Keegan played in Liverpool’s opening day win at Luton, but didn’t appear again in the League until October. A few weeks later, Toshack, who was struggling to find his way after Kennedy’s arrival, looked set to leave Anfield for Leicester City. It seemed a reluctant move: “This club is out on its own…they are the best bunch of players I’ve ever been with,” he said as he headed for the Midlands. But the move fell through after Toshack failed the medical and vowed to work hard at regaining his place. It’s just as well he did, for in 1975-76, the Toshack-Keegan partnership was at its most productive. The old format of cross to Tosh, knock down for Kev worked a treat. The duo scored 39 goals (28 in the League) as Liverpool won the title at the last-gasp, beating Wolves 3-1 at Molineux in the final game. Both players scored in the closing 14 minutes of the contest, and in doing so, consigned the home side to relegation. Liverpool also won the UEFA Cup, beating FC Bruges in the final 4-3 on aggregate. Keegan was about to drop a bombshell on Liverpool. He effectively gave the club 12 months’ notice that he wanted to move – abroad. It became something of a media circus for the next 12 months. Every now and then, Keegan’s interviews would be punctuated with comments like, “because it’s time for me to go” something which started to irritate some Anfield patrons. Liverpool created a bit of history in 1976-77, but once more, Toshack was under pressure, with David Fairclough, a flame-haired, long-legged youngster coming to the fore in the latter months of the 1975-76 season. Fairclough invented the term “super sub” after a series of cameo appearances that proved vital for Liverpool, with seven goals in 14 League appearances. To add to the competition, Liverpool also signed England international David Johnson – a striker who looked like the fifth Beatle in many ways, a sounded like one – from Ipswich Town. At the end of 1976-77, Liverpool deservedly won the holy grail of the European Cup and retained their title. They were denied an historic treble when they were beaten 2-1 in the FA Cup final by Manchester United. Keegan had a good last season at Anfield, scoring 20 goals in 57 games. Toshack, though, missed the finale, although still scored 13 goals in 22 games – his last Liverpool goal coming in February in a 3-1 home win against Derby. Both players were coming to the end of the time at the club. Keegan permed his hair and went to Hamburg, describing it as “the most important step of my life”. He became Britain’s richest footballer in the process and earned Liverpool £ 500,000. Toshack, his partner now gone and Kenny Dalglish signed from Celtic and winning the hearts and minds of the Kop, played only a handful of games and was supposedly moving to Anderlecht when he failed another medical. He was subsequently given a free transfer and became player-manager at Swansea, where he enjoyed considerable success. Both players have eulogised about their time at Liverpool. Keegan still reveres “Shanks” and when Toshack returned to Anfield as Swansea boss, just after Shankly’s death, he unpeeled his tracksuit to reveal a Liverpool shirt with his number 10 on the back. “Once a red, always a red,” isn’t that the saying? Absolutely fantastic article. One of my favourites.